Revisiting SHERLOCK: Series 2, Episode 3 - The Reichenbach Fall | Warped Factor - Words in the Key of Geek. As it began, so it ends. So much then for the stakes, but you can’t have a fall without having a rise beforehand. Where the original Sherlock Holmes was world famous within his own universe, to set up the use of the title, Thompson has to do some fairly quick work in the opening scenes of this episode, elevating our hero to the status of a national hero with a handful of high-profile cases, in particular the return of a painting by Turner of the Reichenbach Falls – making him ‘the hero of the Reichenbach.’ The banality of the British press is skewered beautifully with both the turning of the deerstalker into what John pointedly describes as ‘a Sherlock Holmes hat,’ and with his advice that they will turn on Sherlock because ‘they always turn.’ It’s advice that gives us a sense of this version of Sherlock Holmes – brilliant but oddly blinkered and focused; just as he doesn’t know the Earth goes round the Sun, it’s just possible he doesn’t know how the press works, so Watson exercises his duty of care as a friend, clueing him in. Ohhhhh and then. I’ll be honest with you, I’m not a fan of Stephen Thompson’s work as a rule, but even I have to give the man his due. In writing the Moriartyfest that follows, he goes the extra mile, and then another mile beyond. And then another six miles just for swank, and because he knows he has Andrew Scott to write for, who will not only revel in the scenes he writes, but turn them into gold. The triple crime of the century – breaking into the Jewel House at the Tower of London, opening the gates at Pentonville Prison and opening the vault at the Bank of England, all at once - puts Moriarty where he’s never shown any inclination to be: front and centre and in the limelight. To be fair, if you know your man at all, then you really should follow-along-a-Sherlock, which Watson doesn’t do. 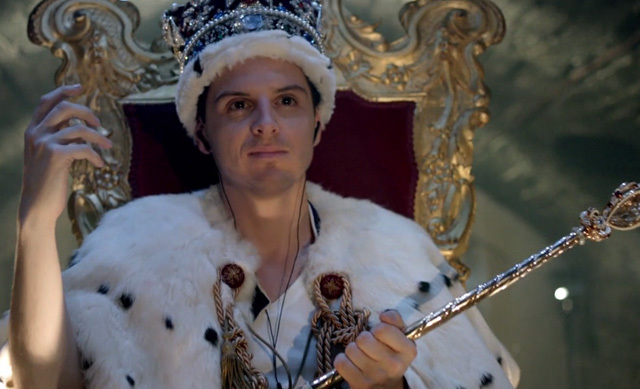 Moriarty doesn’t make a break for it with the Crown Jewels, he simply sits there looking fabulous and louche, having written “Get Sherlock” on the jewel case before shattering it with a diamond and a fire extinguisher. After the crime of the century comes the trial of the century. Moriarty mounts no defence, the jury has no option but to find him guilty. 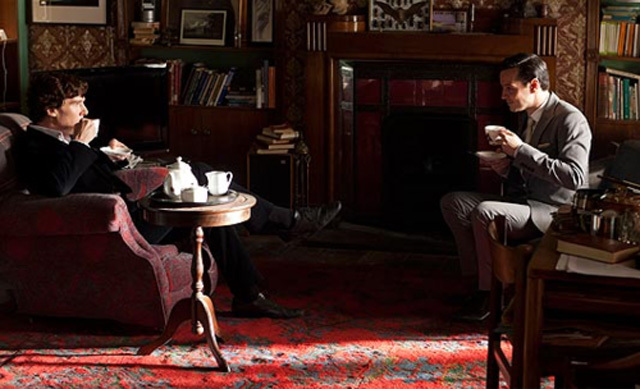 So begins a bidding frenzy for the services of the consulting criminal, and meanwhile, Sherlock and Moriarty have a gorgeous scene together – Moriarty popping round for tea, seeding the idea of a simple piece of code that unlocks every security system on the planet. ‘No such thing as secrecy anymore,’ he claims. ‘I own secrecy.’ It’s here that Moriarty waxes lyrical about their ‘final problem’ too – which we assume is their continued co-existence. It’s intrinsic in the character of Moriarty throughout the ages, this confidence, this ability to be secure in himself even when faced with the man who thinks most like him in the world. It resonates back to their scene at the swimming pool at the end of Series 1, when Sherlock held a gun on him, prepared to kill them all, and Moriarty felt not remotely concerned. It’s a sense of comfort that also reaches forward to the conclusion of this episode and this series – but we’ll get to that. Before that, there’s the fall of Sherlock to contend with. The whisper, the worm of suspicion that gets inside your heard and stops you sleeping. The worm that won’t stop eating away at you. All those incredible crimes. All those complicated realities – can they all have been so real? Occam’s Razor says look for the simplest solution. Many twisted geniuses – or one? The worm feeds even more when Kitty Riley, a journalist snubbed by Sherlock at the trial, turns up the heat. 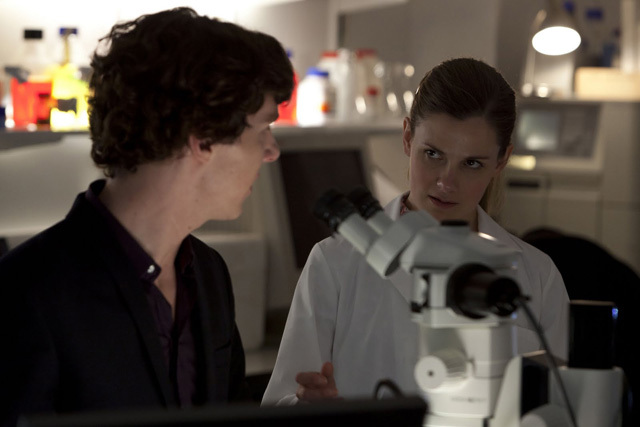 She has a source who knows all about Sherlock’s life, knows things only his nearest and dearest would know. Except – not Moriarty. In a twist that perhaps strains the credulity of the storyline too far (Really? Triple crimes of the century was fine and dandy, but this you take issue with? ), Moriarty is Rich Brook, an actor, best known as The Storyteller from a popular children’s TV show. Turns out that Moriarty has previously been captured and tortured, and that he – like all the best villains – said nothing about himself or his plans until he got something in return: an interview with Mycroft Holmes about his little brother, meaning Moriarty now has all the ammunition he needs to sell the big lie that Sherlock’s a fantasist. And sell it he does, the world turning away, fake-Messiah-style, from its favourite genius, believing the easy lie – he’s a fake, no-one could be that clever. 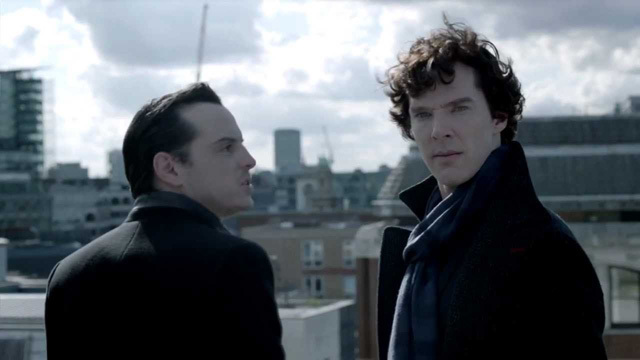 It all leads to Sherlock seeming to isolate himself from everybody but Molly – getting even Watson out of the way, then meeting Moriarty on the rooftop of Bart’s hospital for their final confrontation, the solution to their final problem. Moriarty explains that he’s beaten Sherlock, the ordinary man who talks the talk but is on the side of the angels. Beaten him by the simple expedient of pointing guns at the people he cares for. They can’t be stopped unless the assassins see him jump from the roof. Splat. Dead. Die in disgrace, so your friends can live to revile your memory while I go on, undefeated. Or – be special. Defeat me. Prove to me that you’re like me, and go on – but all your friends will go boom-bang-a-bang and fall dead to the floor, knowing that you couldn’t or wouldn’t save them. What would you do? What would the Ordinary Person do? What would the sociopath do? Sherlock laughs. Tells him of course there’s a way – there has to be a way or the thing makes no sense. As long as Moriarty’s alive, there has to be a way to call off the assassins threatening his friends. 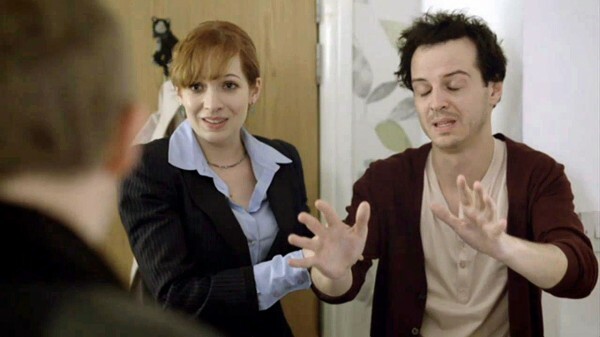 “Well, good luck with that,” says Moriarty, apparently blowing a hole through the back of his own head. Misdirection is a wonderful thing, and for minutes, the great detective seems beaten, flummoxed – how to get out of this situation? The sudden arrival of John allows him to leave a kind of ‘note’ admitting to all the accusations – he’s a fake, a fraud, no-one could be that clever. 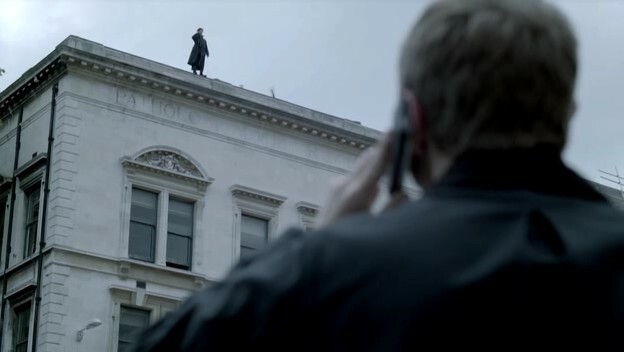 Then Sherlock Holmes, consulting detective, jumps off the roof. There’s a massively convenient, red herring-rich scuffle, knocking John Watson to the ground, and when he gets up, his friend, Sherlock Holmes, is dead. Yes, there are moments in The Reichenbach Fall that make no sense. But it delivers powerful drama and the premise of two super-geniuses on different sides of a line with superb skill, with Andrew Scott proving again he’s the definitive Moriarty of a generation. When Watson, in closing, stands at Sherlock’s grave and demands one more miracle, one more mad escape just for him, pledging his faith in the man he has known, it’s heartbreaking stuff, and we feel it with him. The difference being we get our miracle, as the camera pulls back and shows us Sherlock, lurking behind a tree, a get-out Conan Doyle denied his readers. John Watson, like those readers, must wait without consolation for two long, painful years.